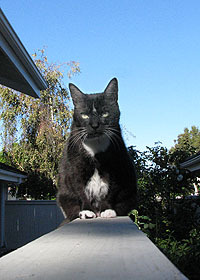 On the left, Domino peers suspiciously at the camera while enjoying a warm day under a beautiful azure sky. 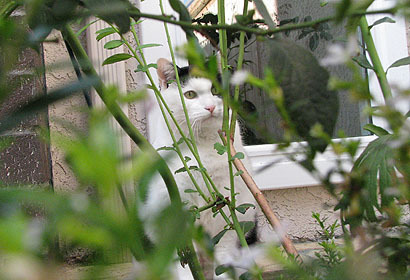 On the right, Inkblot plays games with the camera while skulking around in the garden. Currently, he’s doing his skulking a couple of houses away, safely distant from all the carpet installation and floorboard renovation currently being done on his house. He doesn’t get it, though. The floor doesn’t squeak when he walks on it, so what’s the problem?